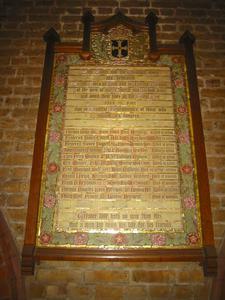 Window and Enamelled dedicatory plaque, the latter set in a wooden frame. Coloured Yorkshire Rose foliage and other flowers on border. Crowned shield bear cross at top. THIS TABLET AND THE WINDOWS ABOVE/ ARE DEDICATED/ TO THE GLORY OF GOD AND IN LOVING MEMORY/ OF THE MEN OF OUR CHURCH AND SCHOOL WHO/ LAID DOWN THEIR LIVES IN THE GREAT WAR/ 1914 - 1918/ AND IN GRATEFUL REMEMBRANCE OF THOSE WHO/ SHARED ITS DANGERS/ (Names)/ GREATER LOVE HATH NO MAN THAN THIS/ THAT A MAN LAY DOWN HIS LIFE FOR HIS FRIENDS.